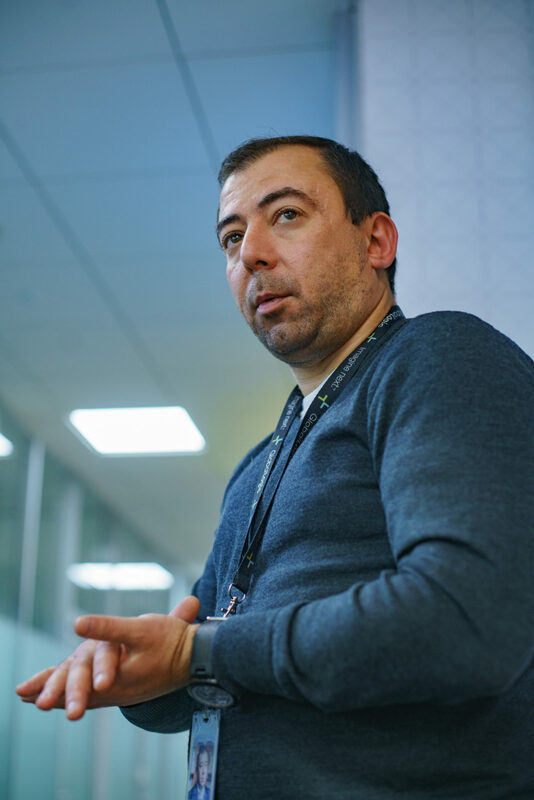 Managing Director of GlobalLogic Ukraine talks about starting a career in IT, the company’s values and his corporate and personal success. Professionally, my life has been always connected with technologies. Of course, my role has gradually changed: I started as an engineer, later supervised developers’ teams, and now I persuade companies that by using digital solutions they will be able to succeed in the economics of the future. My interest in technology, as it often happens during childhood, has started with computer games. At that time, computers often glitched, games often “crashed” and to restart them in MS-DOS system, you had to learn something about informatics on your own. In school I was good at applied sciences and languages, that is why I decided to continue with programming and got enrolled in the Faculty of Aerospace Systems at Kyiv Polytechnic Institute. When studying at the university, I had an opportunity to take part in a few internships in Germany. 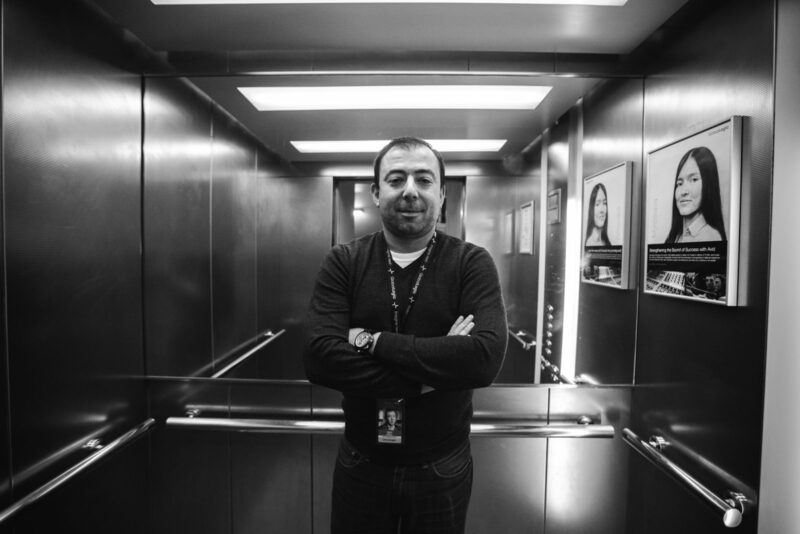 It was my first experience of commercial work: for example, I was involved in developing the software for an automatic gearbox in Mercedes. It was an interesting experience: half of the day you code, and the other half — you test it. Afterwards, I got an offer for 5 years there but decided to stay in Ukraine. Of course, back in 2001, Germany had way more opportunities in IT career wise, but I have never regretted my choice. Where did you work when you returned to Ukraine? My first work in Ukraine was at an affiliated company of Motorola — “Information program systems”. They were just launching an embedded-programming team. This is a complex development direction which requires not only good software developing skills but the ability to adapt it for a specific hardware. Back then, embedded-programming had just started to become more popular in Ukraine, and since I already had experience in working with similar projects in Germany, I got the job. Interestingly, now the embedded software development is one of the key focuses of GlobalLogic, we have a unique expertise in this niche in Ukraine. When have you decided to shift from the position of a programmer to a manager? I was surrounded by talented IT specialists, and at some point, I understood that most likely I wouldn’t become a famous programmer. There are some areas you can only reach a certain expert level in. Everyone has them. In moments like this, you have to stop and think for a moment about your strengths. You have to develop them, build your career around them. Watching my colleagues, excellent technical specialists, I saw how often it is difficult for them to find a common ground. There was a big difference in how they think and what they say. It often happened that people came, talked and dispersed. And the conclusions are different. Already being a team lead, I somehow managed to solve these problems, basically acting as a translator. Because it doesn’t matter how skilled the specialists are if they can’t agree on things, or can’t explain their ideas in a language understandable to the client. If this happens, the quality of the project decreases. I was working at technical positions from 2001 to 2006. At first at Motorola, later — at InfoPulse, where my role was half technical, half managerial. There was more communication in project management, more control over the processes and leading the team in a certain direction — all of these things excited me. In 2007 I got an offer for a position of manager at GlobalLogic — the company had just started working for the Ukrainian market and planned to develop its embedded direction. 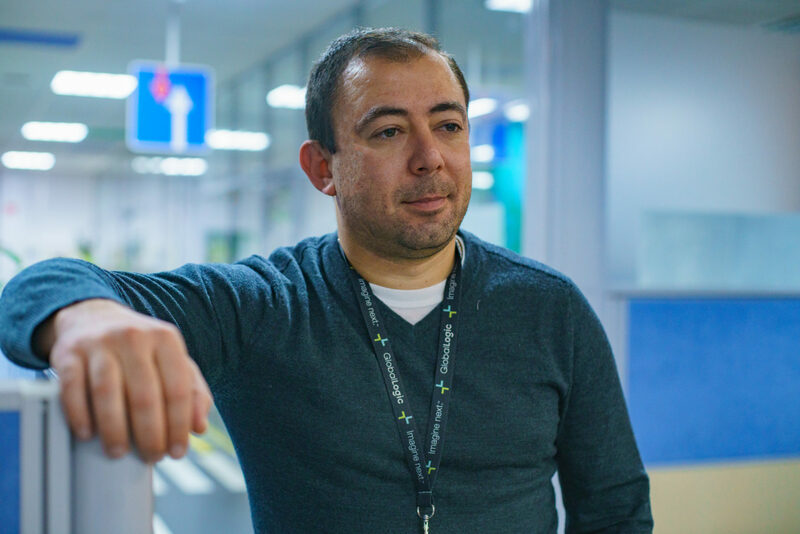 Here I’ve gone from being a team lead at separate projects to head of engineering first in Kyiv, and later in Ukraine. This experience has enabled me to immerse myself in both the technical and business side of projects at GlobalLogic, as well as communicate with clients a lot. In 2014, I became Managing Director at GlobalLogic. What were the key stages of the company’s development? The company was established in 2000 in the USA. The first developing centers were located in India, however, later GlobalLogic saw great perspectives in the Ukrainian market. The first acquisition took place in 2007 in Kyiv, just when I started working there. At that time, there were about 250 specialists working in Ukraine. In 2008, GlobalLogic acquired two more companies in Lviv and Kharkiv, and the number of employees working in Ukraine rose to 1200. The scale of tasks at these companies considerably changed after merging with GlobalLogic: now engineers had the opportunity to be responsible for the full product development cycle, analyze how a specific industry will develop in 3-5 years, and design a ready-made innovative solution. Gradually, the number of R&D projects at the company has increased — now it’s 90%: including consulting, development and design of digital solutions for companies from various industries. In August 2017, we crossed an important mark — 3000 specialists joined GlobalLogic’s projects in Kyiv, Kharkiv, Lviv and Mykolaiv. GlobalLogic is a big company, therefore, it’s obvious that for most areas and technologies you have your own team of specialists. Which areas do you consider the most promising? All projects in GlobalLogic are somehow connected to our big mission — help companies to undergo a digital transformation of their business. Now we’re simultaneously working on 300 projects with 120 clients from different industries. In terms of technologies, we are actively developing the embedded-direction. By efforts of our engineers, software gets to cars, medical devices, house appliances and hundreds of other things that surround us in our everyday life. From the industry point of view — we have a whole spectrum represented. We’re especially proud of our medical expertise. On one hand, software development for a variety of medical devices is a very complex and responsible task, because any mistake can harm the patient’s health. But you can’t be happier if the result is saving human lives. Another example — software used in the television industry for recording, processing, storing and transmitting video. In our offices, we have a few large labs with equipment covering the entire video processing cycle. Our engineers play an important role in creating and developing software for systems that allow watching TV shows, movies and live broadcasts of the largest sports events, like the Olympic Games, for millions of people around the world. I also want to mention the automotive industry. In this area, we create solutions for many international clients (one of them — an information and entertainment system for the car of the future — was successfully displayed at this year’s CES international exhibition in Las Vegas). We also have our own developments. In particular, we are experimenting in the field of digital solutions to help a driver manage a car and again in information and entertainment systems. I just saw that a part of your office is closed for guests. Why? This is a safety issue. When you’re working on something innovative, you do not want your competitors to use your work. We have many leading and high-tech companies among our clients. They trust us to work on their software, and in turn, we guarantee to protect their know-how. Even by getting a small part of critical program code, competitor companies would be able to get an advantage by launching the same or a similar product or service. That is why only authorized specialists have access to labs created specifically for a certain client’s project. After all, any company involved in the development of new tech products should be careful about intellectual property and take maximum security measures. I know that you have media projects. Can you tell us about the most interesting ones? We have many digital media projects with well-known companies. People who write music or edit videos have for sure heard of Avid. We help Avid with simple programs for users to create or edit their own videos, as well as high-quality professional multifunctional products used in Hollywood studios. By the way, 95% of movies there are created with the help of these tools. Examples of these products are mixing consoles used in live performances of Radiohead, U2, Madonna, Black Sabbath etc. Thanks to a complex software developed by GlobalLogic’s experts, you can enjoy quality sound at these concerts. The Economist — is another client we’re working with. It’s primarily a printed media, but no big media could survive today without going hand in hand with the digital world. Modern readers want to get news and analytics immediately, being able to read only the materials that interest them and on a device they are using daily. It was difficult to understand the position of The Economist on the market since they are a publishing agency, not a software company. The Economist asked us for help, and engineers from GlobalLogic developed a digital platform for them. If we talk about technological projects, it’s difficult to choose one. Anyways, if I would pick just one project, I would probably offend our other partners. Of course, it feels good that 80 Fortune 500 companies are among the clients of GlobalLogic. But what makes me happy the most: by transforming the business of our clients, we make people’s lives more comfortable, safer and more vibrant. Despite the fact that we already have 3000 employees, we have managed to keep the atmosphere of a family company. This is very important. How do you manage to develop this “family” feeling? We pay a lot of attention to people, trying to find a reasonable balance between our corporate goals and ambitions of our employees. Every engineer is highly valued here and we create not only a cozy and comfortable atmosphere within the company but also a space for personal and professional development of our employees. 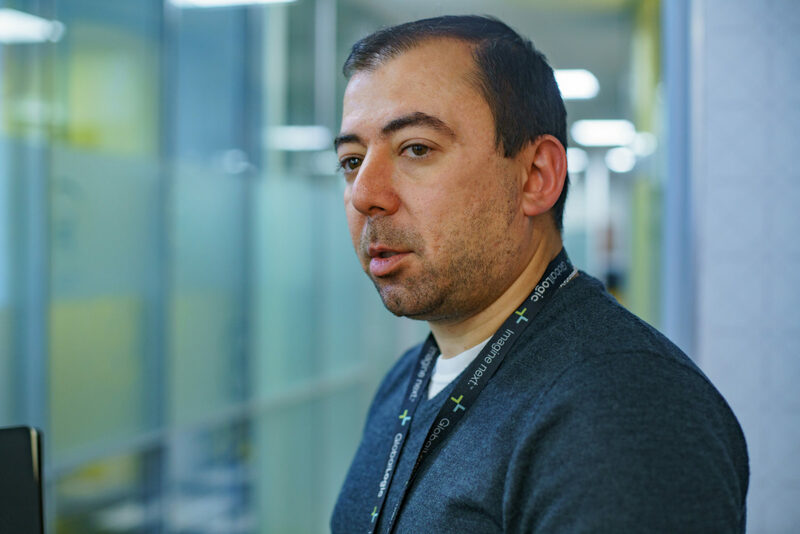 For example, in our office in Kharkiv, there is an innovative incubator BrainMade, where our engineers can experiment with the newest technologies, such as machine learning, big data, embedded, AR, etc. Projects created in this incubator not only contribute to self-development of our specialists, but also allow us to offer innovative solutions and create added value to products of our clients. Do you have separate specialists who help to build professional growth strategies for your engineers? Yes. We call them — people partners. Many companies have employees with similar functions. The only question is how extensively they use their powers. GlobalLogic is simultaneously implementing 300 projects for 120 clients. What does this mean for our engineers? They can choose industries and technologies they really are interested in. The responsibility of people partners is to not only listen to career goals of specific specialists, but also to build their learning process accordingly. We have verbalized them many years ago — openness, teamwork, unity, and innovation. Here, I think it’s first of all about people, not the corporation. For example, we always encourage managers to think about their project as a small business. It not only gives them more freedom, but also more responsibility for the results, more engagement, and motivation. We have acquired a rather big number of companies, and we focused not only on their financial indicators but on their culture and values too. We tried to choose those who share the same spirit with us. 95% of company owners have stayed at GlobalLogic. They are either occupying the same positions or have been promoted, but they don’t want to transition to other companies. I think yes. Any company is successful if its employees are successful. Although we are a rather big company, we have a very high level of employee involvement. This is confirmed by an annual survey conducted by external consultants from Aon Hewitt. Moreover, this indicator is higher in Ukraine than in all the other countries where GlobalLogic is represented. The financial component of success is also quite easy to measure. Recently, a certain percent of our shares was bought by a new investor. When calculating the value, the coefficients that demonstrate the company’s success at a specific moment are used. I can’t share it, but the coefficient given to us by our new investor is very high — we fall into the top three or four companies in the world in this segment. Two of them are already IPOs. Our annual growth is 22-23%, and if we add M&A here, we are approaching 30%. Let’s talk about personal success. Do you consider yourself successful? I am more a team player, and my success is to achieve goals in teamwork and to make people around myself successful. I think I can do it. I really like the saying — you are only as good as the people you surround yourself with. Looking at the people around me, I can say that I am a successful person. I have a wonderful family, a wonderful job, I am surrounded by very interesting people. Your advice for young IT specialists and people with entrepreneurial ambitions. Constantly learn. You have incredible opportunities for that. My last English lesson was with a teacher physically located in Boston. Nowadays, you have access to online courses from the best universities in the world, and you can discover other countries by staying at home and talking via Skype. On the other hand, we are used to fundamental education. First, we learn how to write letters and only after a few years, we are able to write longer texts. However, technologies are now changing so fast, you can’t learn everything fundamentally. You have to be flexible: today you will have to deal with one domain, tomorrow — with a completely different one. If you can’t learn fast enough, you won’t have a chance to succeed. Most importantly — the era of robotization is soon to come. Very soon robots will replace a huge number of people working in certain spheres, for example, in the transport industry. There are tons of examples from other industries too. This will lead to an increase in unemployment. You have to understand: the less intellectual your work is, the higher the probability that it will soon be done by robots. And it’s not futurism of some kind. Yes, robotization can be artificially restrained as, for example, the development of ‘green’ energy was for several decades. But only in dormant countries. In case of Ukraine, I hope it will happen vice versa, and we will strive to develop our creative and knowledge-based economy at the same level as in advanced countries. I’ve recently read that a brain is the only human organ that can develop throughout the whole life. It won’t stop developing unless a person wants it to. Thus, you should never stop with what you have already achieved and constantly self-develop.